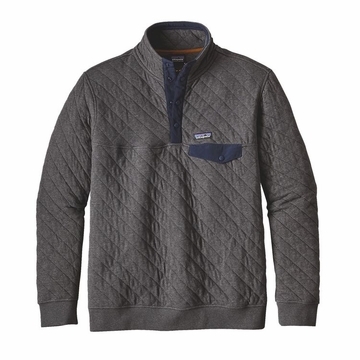 This diamond-quilted, heritage-inspired version of our classic Snap-T Pullover is made of a soft organic cotton/polyester fabric for everyday layering warmth. Lightweight and limber just the way you like to feel when you step into the crux. Made with a soft organic cotton/polyester jacquard knit fabric with lofty fill yarns of textured polyester for breathable, cozy warmth, the Cotton Quilt Snap-T Pullover relishes early-morning belays or cool afternoons (preferably uninterrupted) in the shop. The one-inch diamond quilting creates an effective heat-trapping surface and reduces bulk while increasing compressibility. Weve cut the arms generously with our Y-Joint sleeves to allow unlimited shoulder mobility. The doubled stand-up collar has a snapped placket to block breezy weather. Wide rib-knit cuffs and hem seal in warmth and retain shape. Climbing cord hanging loop and inside contrast collar tape brushed for softness.